Located at 716 W. Broadway, the home was placed on the National Register of Historic Place on May 25, 2001. The NRHP nomination shows the poor condition of the home, complete with photographs, prior to its 1999 renovation conducted by Deborah and Robert Tucker. It was named to the Columbia’s Historic Preservation Commission’s Notable Properties List in 2002. 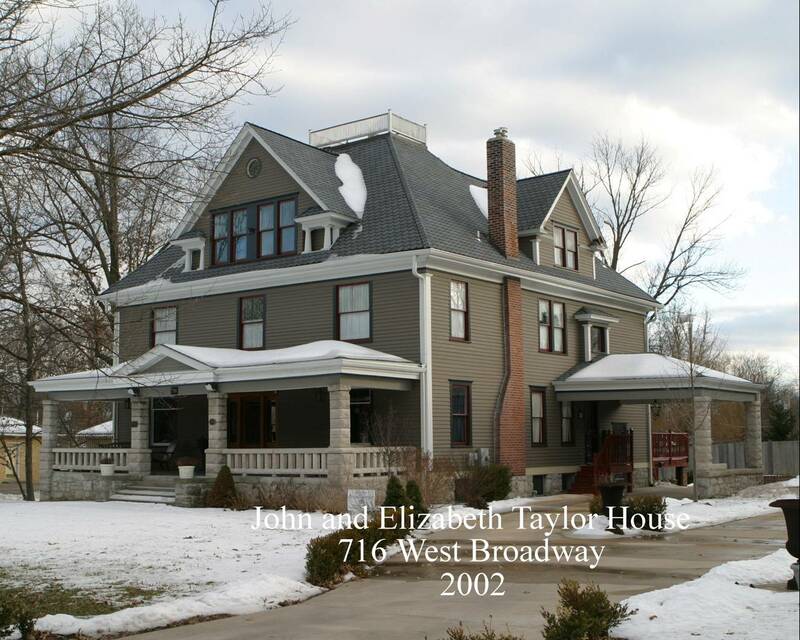 Westwood was platted and developed by John A. Stewart, a former judge of Boone County, who “was one of the first developers in the city to establish both modern public amenities and building restrictions before offering lots for sale,” notes the NRHP nomination form. The Taylors bought one-eighth of the entire Westwood subdivision from Stewart, which comprised six lots and 19 acres, for $23,000. “They built their home facing West Broadway on the north end of that large parcel, and the surrounding acreage remained open for at least another two decades,” the form continues. So who was Taylor that he could afford such expenditures and to build this massive home? Born in Pennsylvania, the nomination form calls him a self-made man. He attended school until he was 12, was then apprenticed to a cabinet maker. He married Lida Stroup in Iowa and then moved to Huntsville, in Randolph County, Missouri. His wife died and he married Huntsville native Elizabeth F. Reed. He had four children with his first wife and would go on to have seven children with Elizabeth. He opened piano and furniture stores in several mid-Missouri towns, including Columbia. He gradually shifted his business to automobiles and, the nomination form notes, acquired the local Dodge dealership before the car was even on the market. In 1917, he ran an ad in the Boone County Atlas proclaiming himself a wholesale and retail dealer in pianos and automobiles. He also served on the board of directors for the Columbia Commercial Club, the nomination form notes, and the Taylor House Inn website states he was on the Columbia City Council and the Stephens College Board of Directors. John Taylor died in 1932 at age 83 and his obituary was printed on the front page of the local newspaper with a photograph, the nomination form states. The mayor and city council all attended and city employees were even given time off for the funeral, the document continues — noting his son Thomas Taylor was a city councilman at the time. Wife Elizabeth continued to live in the house with her daughter Eleanor, who was then an assistant professor at the University of Missouri. Then in 1935, Elizabeth had the house divided into a triplex. Elizabeth also developed the surrounding acreage. As the years passed, the house moved out of the hands of the Taylor family and fell into some disrepair. In 1999, Deborah and Robert Tucker, then owners of Tucker’s Jewelry, under took a $1.3 million renovation and then conversion of the home into a luxury bed and breakfast. The home was featured on HGTV, with a video highlighting the home, its renovation and historical finds the Tuckers came upon. The home was also featured in a January 13, 2010 Columbia Missourian article on an effort to have a section of West Broadway placed on the National Register of Historic Places.